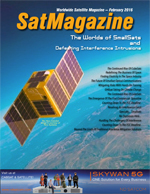 Only six months have passed since my article The Continued Rise of CubeSats was published in the July/August 2015 issue of SatMagazine. Redefining The Business Of Space, Ball Aerospace is building an instrument for the company’s first CubeSat mission. We call them Nanos, Picos and CubeSats—vessels of voyage that 500 years ago might have been the Niña, the Pinta and the Santa Maria. The Future Of Smallsat Optical Communications, By David Mitlyng, Senior Vice President, Business Development and Strategy, BridgeSat, Inc. Space-based optical communication systems are poised to take a breakthrough role in commercial smallsat missions. Over the past couple of years, IRG has led the push for Carrier ID (CID) to make it far easier to resolve interference when such occurs. A basic tenet of economics is that selling at a lower unit price very often means selling more units. The emergence of commercial space programs that include larger constellations, plus constrained DoD and NASA budgets, are today’s drivers of the need for lower cost subsystems—and often from non-traditional, and smaller size, suppliers. Over recent months, there has been much discussion about upcoming deadlines for Carrier ID (CID). The global space industry is on the cusp of a major revolution. Accessing space is transitioning from something that was only available to an exclusive club that was comprised mainly of government entities, to a new, democratized era in which smaller organizations with smaller budgets are becoming increasingly active. These developments are the result of a fundamental shift in the launch industry. GHGSat Taking On Climate Change, By Stephane Germain, President + Founder, GHGSat Inc.
A smallsat owned and operated by GHGSat Inc. of Montreal, Canada, will soon offer a revolutionary new way to measure greenhouse gas emissions from industrial sources around the world. The advent and growth of data-hungry media such as HDTV, mobile services and satellite radio have made satellite links indispensable for global communication. Resolving A VSAT Interference Event, SES approached VeriSat to develop and produce a system for all satellite operators, and this became SatGuard. In 2015, VeriSat launched SatGuard, a unique tool with patent-pending technology for identifying the source of adjacent satellite interference (ASI) and cross-polar interference (XPOL) caused by VSAT (MF-TDMA) terminals. Clyde Space launched Scotland’s first satellite, UKUBE-1, in July of 2014. UKUBE-1 is a 3U CubeSat carrying six individual technology payloads from a range of UK organizations.